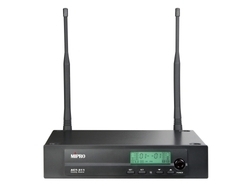 Providing you the best range of mipro mr-515 single-channel non-diversity, act-747 quad channel true diversity receiver, mr-823 dual channel diversity receiver, act-312 dual channel diversity receiver, mr-818 single channel true diversity receiver and act 311 single channel diversity receiver with effective & timely delivery. 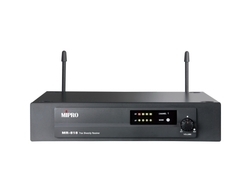 We have gained huge prominence by supplying and trading supreme quality MIPRO MR-515 Single-channel Non-Diversity. These products are preferably used for wireless sound solutions owing to their effective modulation, range and sound clarity. With the procurement being done from well-known vendors, these systems possess excellent functionality and robustness. Moreover, we provide these products to our customers at pocket-friendly rates in tamper proof packaging. Output level accurately pre-adjusted to mach microphone capsule sensitivity so that users don't need to adjust the volume of receiver. 8.3(W) × 1.7(H) × 6.7(D) in. Varied specifications on carrier frequency range and maximum deviation to comply regulation of different countries. Our firm offers a high-quality range of ACT-747 Quad Channel True Diversity Receiver. 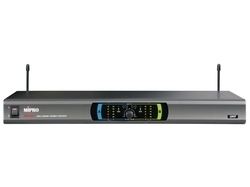 EIA standard 1U rack-mountable metal receiver. 104 selectable frequencies and 16 preset compatible channels per band. More with multiple bands. Industry’s only full-colour VFD screen delivers a bright, clear viewing in day/night environments. MIPRO RCS. Net software allows real-time computer set up, control and monitoring. All controls are intuitive and easy setup via a single rotary knob. 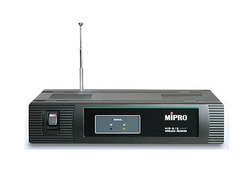 The receiver provides bias voltage for MIPRO antenna systems. 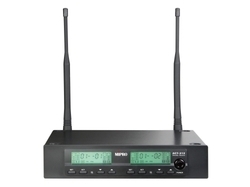 Our firm is involved in manufacturing and supplying a huge range of MR-823 Dual Channel Diversity Receiver. 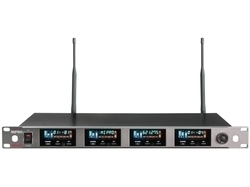 The innovative ACT 3 Series wireless ACT-312 Dual Channel Diversity Receiver microphone systems are a culmination of years of extensive design and manufacturing experience. No wiring and adjustment required PCB, LCD and front panel are integrated. Featuring 1/2U receivers of single-channel ACT311 & dual-channel ACT-312 and 1U receivers of single-channel ACT300. EIA standard 19” rack-mountable metal chassis is used instead of cheap plastics. Featuring backlit LCD instead of LED display for ease of use and professional appearance. PLL-synthesized technology for RF stability and matched with rugged ACT-30H & ACT-30T transmitters. Note: Design and made in Taiwan. Advanced features and functions make it ideal for professional applications with affordable prices. 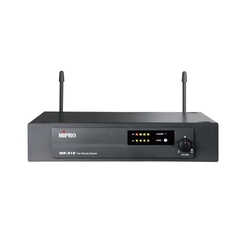 This series features new UHF PLL fixed frequency design with proven quality, MR-818 Single Channel True Diversity Receiver easy to use and affordable price for a wide selection of wireless applications. This series has advanced RF circuitry to improve anti-interference characteristics and increase compatible interference-free channels. Advanced true diversity technology ensures optimal reception range and eliminates signal drop-outs.his series features new UHF PLL fixed frequency design with proven quality, easy to use and affordable price for a wide selection of wireless applications.This series has advanced RF circuitry to improve anti-interference characteristics and increase compatible interference-free channels. Advanced true diversity technology ensures optimal reception range and eliminates signal drop-o. The innovative ACT 3 Series wireless microphone ACT 311 Single Channel Diversity Receiver systems are a culmination of years of extensive design and manufacturing experience. No wiring and adjustment required PCB, LCD and front panel are integrated. Featuring 1/2U receivers of single-channel ACT311 & dual-channel ACT-312 and 1U receivers of single-channel ACT300. This series adapts dual-tuner true-diversity ACT 515 Single Channel True Diversity Receiver circuitry and delivers professional performance at affordable price. Instead of low-cost plastic chassis and plain LED display, EIA standard metal chassis and dual-colour backlit LCD are applied to enhance product quality and user convenience. Be sure to pair up with ACT-50H handheld and ACT-50T bodypack metal-cased transmitter where users can easily obtain superb sound quality. 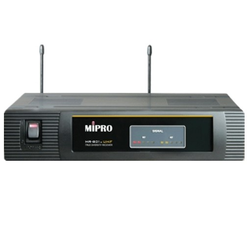 Our corporation brings forth for our clients a wide range of Mipro Single Channel. Developed with the greatest precision, the offered channel is designed by consuming amazing quality unfinished material and updated technology at vendors' end. Apart from this, our channel goes through numerous tests under the observation of quality specialist. Our clientele can take the whole gamut of us only at affordable rates. We introduce ourselves as an eminent distributor, wholesaler, trader, and supplier of Professional Wireless Microphone. 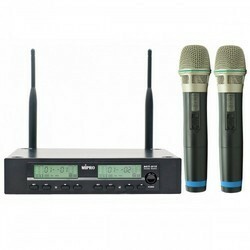 These wireless microphones are designed by consuming high grade approved components and updated technology in synchronization with market norms. 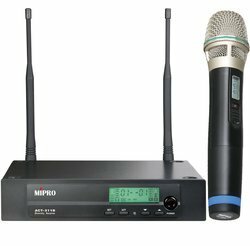 Along with that, the wireless microphones offered by us are extremely applauded by the customers for their precise performance. 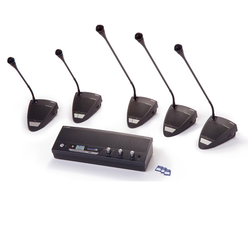 Our firm offers a high-quality range of Wireless Discussion System. The wireless system can be adjusted to meet any discussion requirement: from a basic set-up requiring no operator to a fully interactive voting arrangement. We are highly appreciated distributor, wholesaler, trader, and supplier of a wide range of Table Top Microphone. We examine the table top microphone in numerous factors in order to ensure its quality; also these are available in diverse stipulations. Apart from this, our customers can take this tabletop microphone from us at affordable rates. 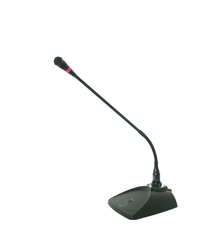 Our firm is involved in manufacturing and supplying a huge range of Mini-Gooseneck Microphone. Can be used as a handheld or lavalier microphone when installing to MTG-100T portable transmitter with a neck lanyard. This series features new UHF PLL fixed frequency MR-812 Dual Channel Diversity Receiver design with proven quality, easy to use and affordable price for a wide selection of wireless applications.This series has advanced RF circuitry and proprietary filter to improve anti-interference characteristics and increased compatible, interference-free channels. Advanced true diversity technology ensures optimal reception range and eliminates signal drop-outs.This series features new UHF PLL fixed frequency design with proven quality, easy to use and affordable price for a wide selection of wireless applications. This series has advanced RF circuitry and proprietary filter to improve anti-interference characteristics and increased compatible, interference-free channels. Advanced true diversity technology ensures optimal reception range and eliminates signal drop-outs. 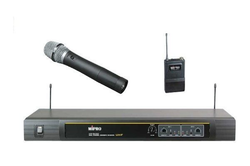 Our firm offers a high-quality range of MR-801A Single Channel Diversity Wireless UHF Microphone. It is manufactured using top quality materials and latest technology and tested under various quality parameters. Our firm is involved in manufacturing and supplying a huge range of MR-518 Double Antenna VHF Wireless Microphones. We design the given product following industrial standards by making use of best quality material and modern technology. Leveraging on our corporate experience, we have emerged as notable distributor, wholesaler, trader, and supplier of Wireless Microphone. These are developed with the greatest precision, the offered bodypack transmitter is designed by consuming amazing quality unfinished material and updated technology at vendors' end. Apart from this, our bodypack transmitter goes through numerous tests under the observation of quality specialist. Our clientele can take the whole gamut of us only at affordable rates. 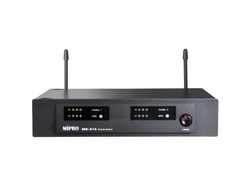 Mipro 311 wireless mirophone are dual uhf selectable frequency microphone used widely through out India. Enquire us for more consultation and orders ! 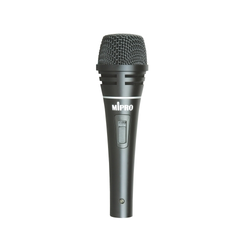 Mipro 312 dual wireless microphones are one of the widely used phone throughout Iindia. Enquire us for more consultation and orers ! !